German rockers Pyogenesis began their career in the early '90s, making a gothic death metal hybrid that sounded much like Paradise Lost. They kept this style throughout their first two EPs, but started to tweak it on their first full-length album, 1995's Sweet X-Rated Nothings. The vocals were much clearer and the sound was a little less dark. But no one could have expected things to change as dramatically as they did, later that year they released Twinaleblood to their shocked fanbase. Gone were the doomy lyrics and heavy riffs, they were replaced with a pop-punk sound that instantly alienated much of their audience and pushed their career into a much more commercial direction. Regular four panel Xeroxed copies. Studio tapes with stickers on the shell. No lyrics. First Version. Regular four panel Xeroxed copies. 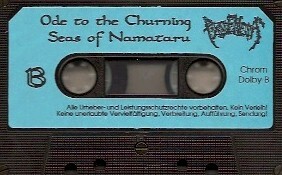 Studio tapes with stickers on the shell. No lyrics. Second Version.